The US Geological Survey (USGS) has added more earthquake related visualizations for Google Earth. A couple of weeks ago they released a large collection of visualizations for GE as part of the 100th year anniversary of the 1906 San Francisco Earthquake. 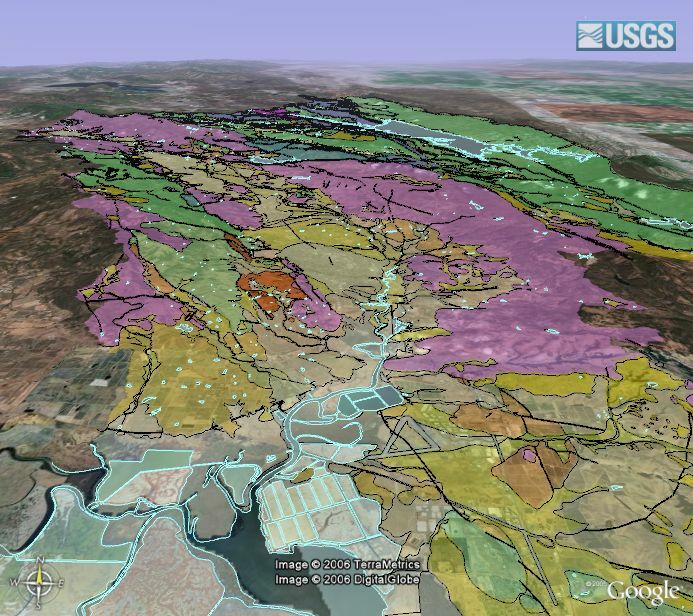 The USGS has now released a collection of Geologic Maps (maps which show the age and types of materials at the surface) for several counties in Northern California. You can download either PDF, JPG, or Google Earth versions of the maps. The GE files are large, ranging from 1.6 Mbytes to 15 Mbytes - I would advise loading only one at a time and deleting them from your "Temporary Places" before loading another. Here is an example of Napa County (8.2 Mbytes). You might be wondering what the colors represent. There is a map key here, and I recommend at least reading the overview of "What is a Geologic Map?". These maps are quite interesting. 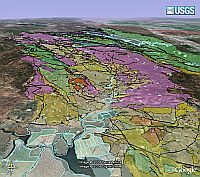 Geologists use these maps for helping identify hazardous areas, to find good gelogical resources, to help understand our environment, and to help understand the geological history of an area. Read more here.